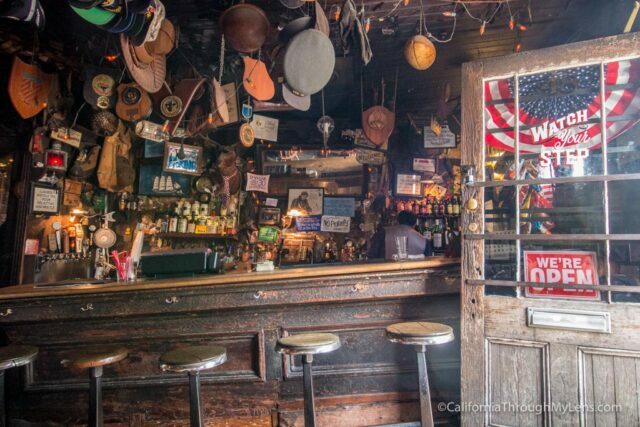 No trip to Oakland is complete without a visit to one of California’s best and most historic bars. 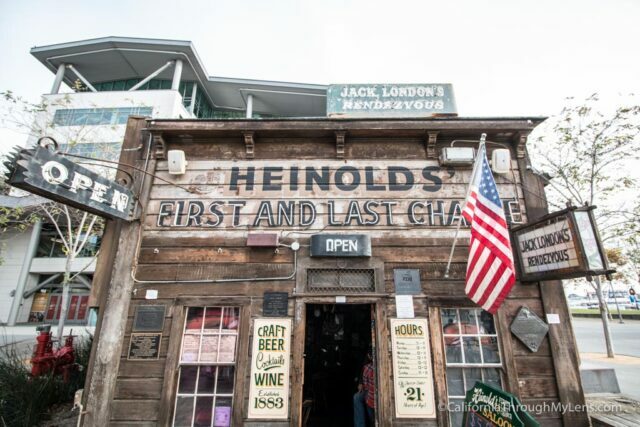 Built in 1883, Heinold’s First and Last Chance Saloon is a small one room establishment that was featured in a couple of Jack London novels and has a broken bar from the 1906 earthquake. It is the kind of place that you won’t want to leave when you go for a drink, assuming you can even find a place to sit/stand. Here is all the information on this famous bar. Open Noon to 11 PM most days and usually 1 PM on the weekends. 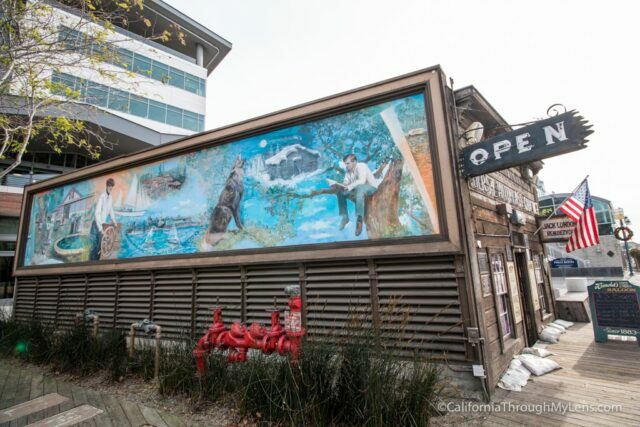 The bar itself is located in the east section of Jack London Square. There is no parking specifically for it, and you will need to walk to get there. You can park in one of the many paid structures around the square, and the proceed down the cement walking path to the bar. 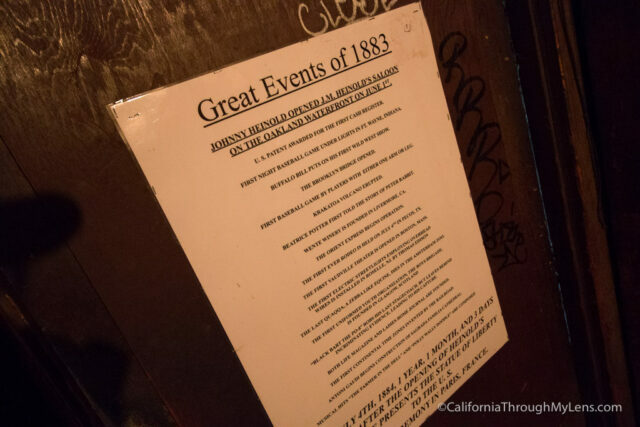 The pub started its life a bunk room for nearby oyster workers until it was bought for $100 in 1883 and converted into a bar by Johnny Heinold. It is known as “first and last chance” because it was close to where the boats would leave and it was the first and last spot for sailors to drink when they left or returned. 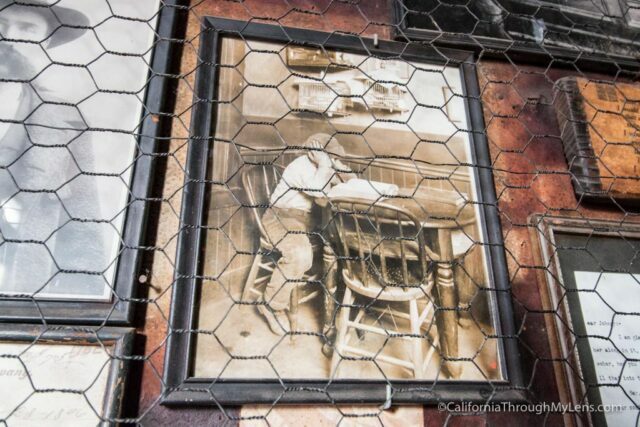 As a schoolboy growing up in Oakland, Jack London would come to the bar and sit at its tables to study for school. As he grew older, he spent time there listening to the stories of the sailors, even using them to create the book The Sea Wolf. 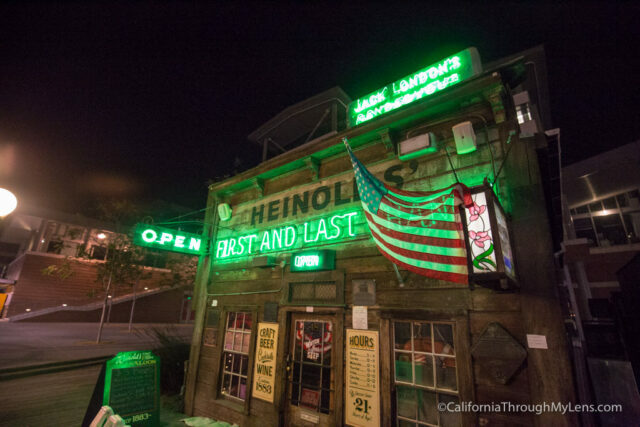 Heinolds is the last commercial establishment in California to still have its gas lighting, and the bar is permanently slanted from the 1906 earthquake, after which it was never fixed. When I first went to Heinolds on a recent trip to Oakland, it quickly became one of my favorite spots in the city, and I went back two more times. It is one of those places where you wish the walls could speak as they would surely have a lot to say. 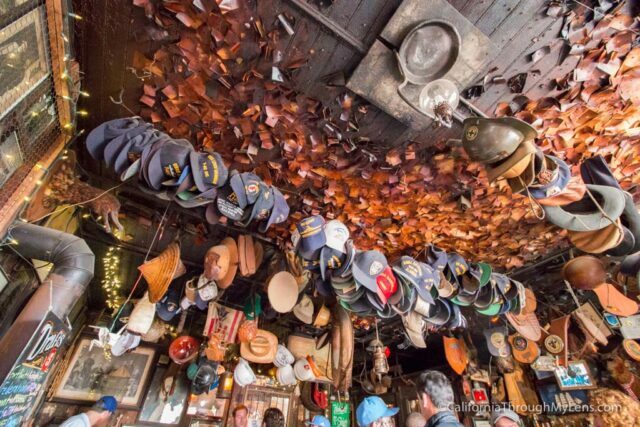 The ceiling is covered in all sorts of pieces of history and knick knacks. There are helmets from the world wars and large gag spiders that can drop down on unsuspecting visitors. The best part of the bar is sitting on the bar stools though. They are at an angle, and your drink will sit precariously in front of you at that same angle as well. 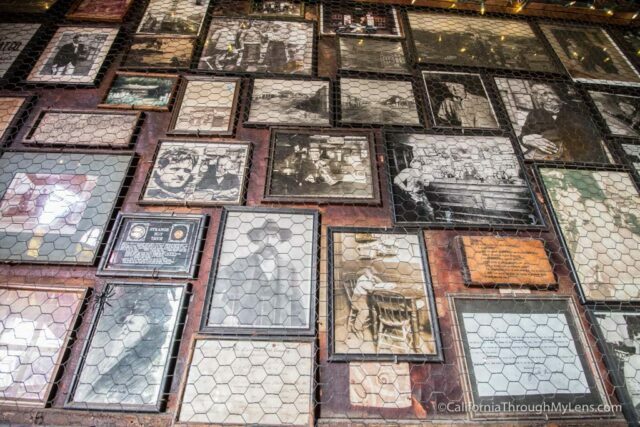 The walls are covered in old pictures, many of which feature a young Jack London. The table right next to the door is the same exact one that he sat at in the picture of him studying. It’s pretty crazy to see it still there. In the back, there is a moving picture movie that you can spin to see the story move like a flip book. As I said, this place just oozes cool. 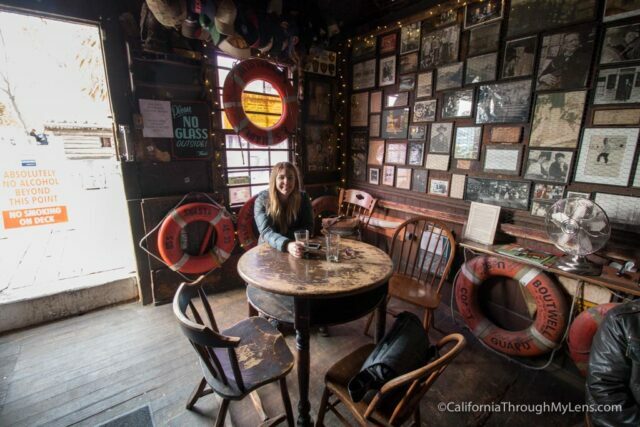 Outside of the bar is the cabin that Jack London lived in when he was in Alaska. 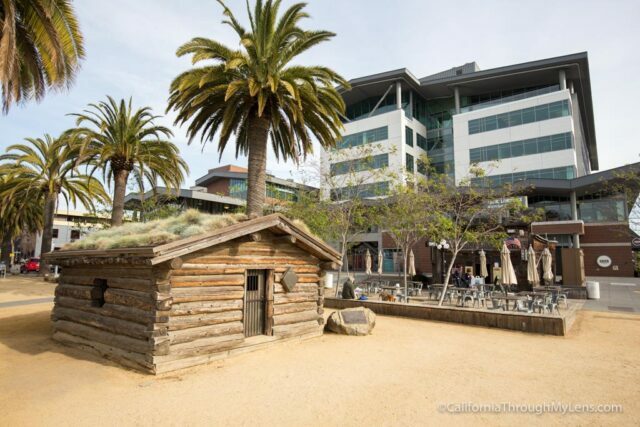 You can’t go in it, but it is a pretty cool piece of history in Jack London Square. There is also a metal statue of a wolf outside of the cabin that pays homage to White Fang, one of his most famous stories. 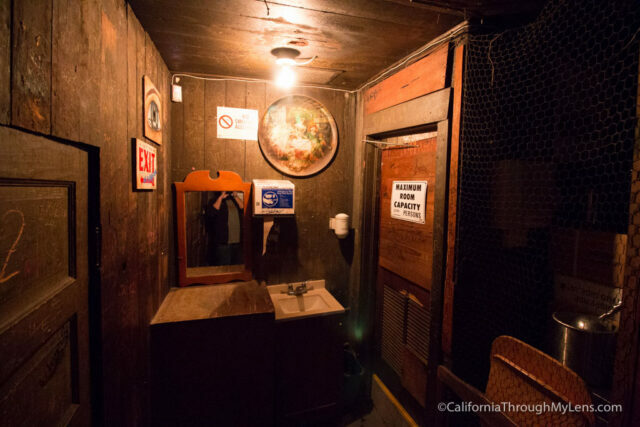 As you can see, this is an excellent spot to truly experience California history. No trip to Oakland is complete without visiting it. Be sure to check it out and let me know what you think in the comments.